Planters are shaped from metal by skilled craftsmen utilizing precise folding of the metal to create a planter that uses no welding during the manufacturing process & assembles into a rectangular shape from five panels. Planter panels interlock together to form incredibly solid plant container that can accommodate large plants. Most of all, the planter is simple, modern & minimalistic. 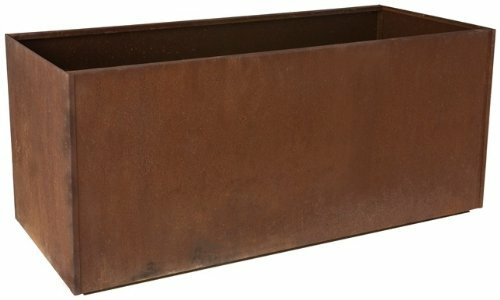 Corten steel planters do not ship pre-weathered & will arrive with the bare steel finish which will have to weather over time to develop a golden brown rust color & Texture. Planters should be placed on grass during weathering process to avoid staining to adjacent material.